Paul McGinley had his wish come true this week when the Governing Board of the Official World Rankings announced changes to the system. The Dubliner complained in May that the current system penalises players who play more often. "At present, we have a system that rewards guys who basically play 20 events a year and play decently in those events. We should be encouraging guys to play more," said the world No 200. "It's very hard to have a high point average in the rankings if you play 30 events a year. I am not a mathematician, but we've got to find a system that does not penalize players for the amount they play." Looks as though the powers that be were listening to the man who could be one of Colin Montgomerie's Ryder Cup vice-captains next year. “The Board believes this measure will encourage players to play more often, which will be a positive development for all Tours and the game of professional golf in general,” said Sir Michael Bonallack, Chairman of the Governing Board of the Official World Golf Ranking. Rather than delay the application of the rule for a two-year period, as has been the case with other changes, the Board agreed to implement the new system in stages, beginning January 2010. This process is aimed to avoid any significant changes in a player’s ranking prior to any Official World Golf Ranking eligibility cut-off date for a Major Championship or World Golf Championship. The current “Minimum Divisor” of 40 events over the two-year ranking period will remain unchanged. Starting on Week No.1 2010 (week ending January 3) a Maximum Divisor will be introduced represented by a “Player’s last 60 events”, followed by a reduction of the number of events every six months until finally on Week 1 2012 (week ending January 8) with a Maximum Divisor of the “Player’s last 52 events”. Revved up Paul McGinley got his motoring running with a super 69 at vicious Valderrama - then set his sights on Ryder Cup points. Just a day after declaring that he felt like a Formula One car with the wrong set up, the Dubliner grabbed the clubhouse lead in the Volvo Masters and finished the day just a shot behind leader Graeme McDowell. And he did it in style, coming back from one over par with four to play with a birdie at the 15th and an amazing, eagle two at the 386-yard 16th. McGinley confesses: "It’s been hell"
Paul McGinley reckons Padraig Harrington has the game and the guts to deny Tiger Woods the $10m FedExCup jackpot and future majors. McGinley and Harrington after their World Cup success of 1997But the battling Dubliner is more worried about recovering from golfing “hell” so that he will have enough credibility with the young guns to land the European Ryder Cup captaincy at Gleneagles in 2014. Paul McGinley is facing up to two months out of the game after undergoing yet another operation on his left knee. The 42-year old Dubliner had surgery to clean out damaged cartilage in his troublesome left knee - the sixth operation he has undergone on the same knee since he broke his knee cap playing gaelic football when he was 19. 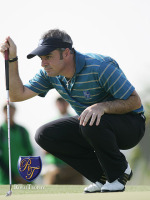 "I don't know what the situation is in the long term but my knee is disintegrating at a rate," said McGinley, who finished 104th in the Race to Dubai for his worst ranking in 18 years on tour. If Paul McGinley had his way, we’d all be using the traditional V-grooves on tight golf courses with rock hard greens. 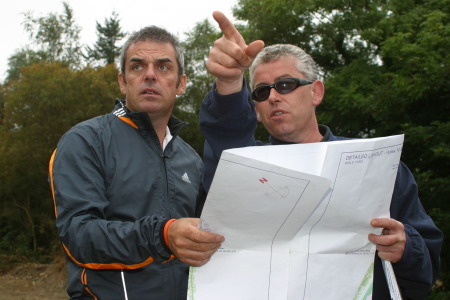 But this is still the bow and arrow era, as the great Ulster amateur Brian Hoey likes to call it, and McGinley does not believe that the game’s governing bodies have gone far enough in their efforts to put more emphasis on driving accuracy. Paul McGinley knows he will be without many of the top GB&I players in Paris next month. Picture by golffile.iePaul McGinley believes he will have to prove himself all over again when he skippers a decimated Great Britain and Ireland in next month’s Vivendi Seve Trophy in Paris. The 44-year old Dubliner is resigned to the reality that he will be asked to advance his Ryder Cup captaincy credentials with a team weakened by no-shows for the second edition in a row.